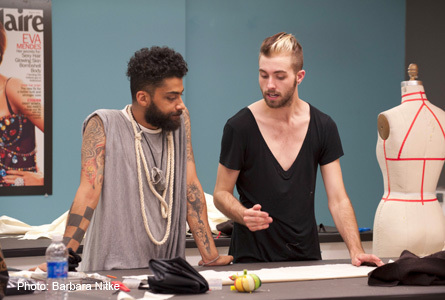 PROJECT RUNWAY: Sneak-Preview, Designers Are Dropping Like Flies! Michael Kors says, “Fashion is not for sissies!” Competitor Gunnar Deatherage says in response to the female designer leaving in the middle of the night “she took the cowards way out”. Remaining designers receive their fourth challenge. Ven Budhu has to make it work! (L-R) Sonjia Williams and Christopher Palu working together. (L-R) Fabio Costa and Gunnar Deatherage working together.